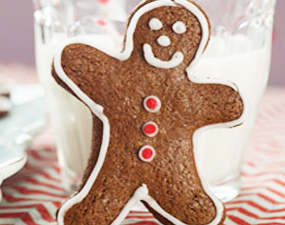 Can you catch a GLUTEN-FREE gingerbread man? You can now with this perfect-for-the-holidays rollout recipe! It’s ideal for making your favorite little people or other festive shapes. 1) Whisk together the first 8 ingredients (through the cloves) in a medium bowl. Set them aside. 2) In the the bowl of your stand mixer or with an electric mixer, beat the butter and brown sugar until light and fluffy. 3) Add the egg, molasses, and vanilla, and stir on medium-low speed until well blended. Don’t mix on high speed at this point; you want to avoid adding air to the dough. 4) Add the dry ingredients, and blend on low speed until incorporated. 5) Divide the dough in half, and place each half on a piece of plastic wrap. Pat the dough into flat disks, wrap completely, and chill in the refrigerator for 1 to 2 hours, or overnight (see “tips,” below). 6) Preheat your oven to 350°F. 7) Remove the the dough from the refrigerator and roll disks out about 1/4″ thick. 8) Cut the dough with your choice of cutters,and place on a parchment-lined baking sheet. 9) Chill the baking sheets of cut dough for about 15 minutes before baking for 8 to 12 minutes. The cookie will be firmer on the edges, but still soft in the center when done. 10) Allow to cool completely before decorating with royal icing and candies or dried fruit.